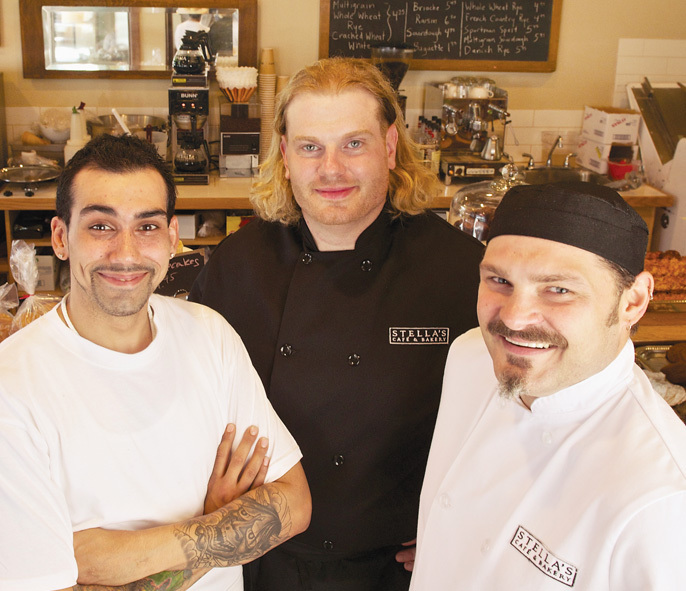 Stella’s Café and Bakery – From left to right: Bakery Chef Roland Gregoire, Executive Kitchen Manager Derek Pauls and Executive Chef Johnny Goletz. A wise man once wrote, “eaten bread is soon forgotten.” We pity Thomas Fuller, as the poor chap died more than three centuries short of revelling in Stella’s Café & Bakery bread-centric menu, and surely eating his words. 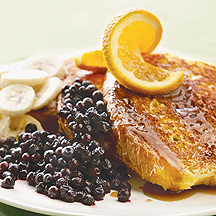 Since 1999 Winnipeggers have been meeting, and eating fresh-baked delights such as decadent brioche-based French toast and peach chutney laden garden burgers on hearty multigrain buns at sunny Stella’s Café & Bakery. The flagship restaurant at 166 Osborne hasn’t changed much, it’s retained its casual neighbourhood charm, serving as a role model to its six sister stores. In 2005 Tore and Lehla Sohlberg bought all of the interests in Stella’s. Today, the owners are involved the overall direction of the business and new developments, but have handed the day-to-day reins over to Director of Operations Grant Anderson, or ‘Yoda’—a playful moniker he’s been christened by the staff. No longer a tiny owner-operated eatery, Stella’s wields significant purchasing power. Local suppliers are taking note and making adjustments to secure business with the restaurant and it’s whole foods mandate (no stabilizers or preservatives). “We challenge them, and they do a good job of meeting our demands,” says Anderson. Northern Meat Services is one local company that happily tweaked their operation, when partner Stella’s decided to cut back on packaging, by switching from canned to dried legumes. Soaking beans takes a bit more time, but is the sort of holistic adjustment important to this company intent on reducing its carbon footprint. Stella’s has nurtured relationships with many great local suppliers such as Garden Grove for seasonal vegetables, Harborside Farms and Cypress Meats for grass-fed beef, Dunn-Rite poultry, Canada Green Pack for compostable take-out cups, eggs from Nature’s Farm that are free of antibiotics and synthetic yolk enhancers, butter from Notre Dame Creamery and nuts, seeds and dried fruit from DeLuca’s Specialty Foods. For it’s continuing commitment to informed local purchasing, Stella’s Café & Bakery has earned this year’s Good Food Manitoba Award for Restaurant of the Year. The annual award from Ciao! magazine recognizes a local restaurant and the people behind it who demonstrate an ongoing commitment to regional cuisine. The people behind the food at Stella’s are numerous, with 380 individuals involved in maintaining pleasant, consistent experiences that diners cherish. The feel-good culture of Stella’s that is palatable with each meal is the result of a trickle down effect that begins in the kitchen with confident, scratch-made dishes. “Our cooks actually cook, they aren’t button pushers,” boasts Tore Sohlberg. And cook they do, everything from soup (all of which are vegan sans garnish) to mayonnaise to Stella’s signature strawberry blueberry jam is prepared at the Sherbrook Street commissary under the watchful eye and practiced hands of Executive Chef Johnny Goletz. Goletz is one of three culinary musketeers responsible for Stella’s smooth sailing. He develops recipes and executes the creation and distribution of numerous condiments and dish components for each of the restaurant’s outposts. To put sheer quantities in perspective, during the course of a week Stella’s goes through about 63,000 eggs. Investment in people resources through training and openness returns dividends as Stella’s grows a small army of expert employees eager to grow with the ambitious company. Like a shark in the ocean, this business can’t stay still for long. Take for instance the burgeoning bakery led by Bakery Chef Roland Gregoire, which has increased its menu of baked delights by 800 per cent since opening December 2010. Cool as a cucumber, Gregoire is a details man tasked with orchestrating involved timings for all of the bakery’s bounty. Each bread requires specific coaxing and coddling to rise to it’s full glory, there are multiple proofs to keep track of and a six year old sourdough starter to maintain. Stella’s Bakery supplies all of it’s own restaurants, many other Winnipeg eateries and it’s own retail bake shop with 1,500 loaves baked daily. Click this link for margherita pizza foccacia recipe and step-by-step tutorial from Bakery Chef Roland Gregoire. Executive Kitchen Manager Derek Pauls and Executive Chef Johnny Goletz. of Stella’s Café and Bakery, and can be found in the latest issue of ciao! magazine. 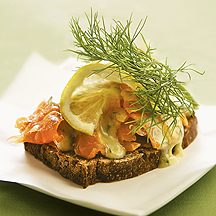 Sweet and salty mingles throughout the delicate flesh of this no-cook meal. 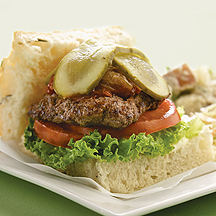 Brawny and lean, these Manitoba made patties standout sandwiched in fluffy, fresh-baked foccacia.